National Bank held an official groundbreaking ceremony on Wednesday (November 7) to kick off the construction of what will become the financial institution’s new head office in Montreal. The event was held in the presence of numerous dignitaries, suppliers, customers and employees of the Bank. At a cost of over half a billion dollars, the project is the largest real estate investment in the city in the past 25 years and marks a new milestone in the history of the Bank, founded almost 160 years ago. The Bank also announced an investment of over $20 million to renovate its Toronto offices at 130 King Street, and celebrated the opening of its new Vancouver offices on November 1, where teams occupy five floors at 475 Howe Street, in the financial district. 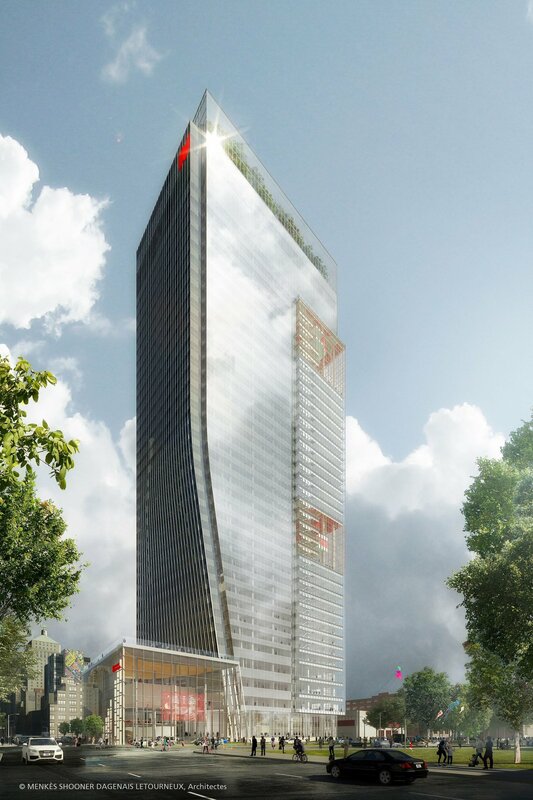 With its 40 floors, the Bank’s new head office will be one of the tallest office buildings in Montreal. Aiming for a LEED v4 Gold and WELL certification, the building is designed to meet the world’s strictest standards in terms of sustainable construction, integrated design and occupants’ health and well-being. National Bank has involved its employees in the planning of spaces and services offered inside the building. “We’re glad that National Bank isn’t building just a new head office in Montréal, but a tower designed to meet the strictest global standards in terms of both sustainable construction and the well-being of its occupants. Montréal proudly welcomes this new building, located at the gateway to downtown, as well as these new green spaces which will blend beautifully into our city and reflect our leadership in sustainable development,” stated Montréal Mayor Valérie Plante. Over 1,000 employees attended the groundbreaking event to celebrate the beginning of the construction of their future work spaces and took part in a group aerial photo picturing the Bank’s brand and colours. The Montreal architect firm Menkès Shooner Dagenais LeTourneux Architectes will be in charge of the design of the new head office, while Broccolini will be the general contractor and project manager and Pomerleau the structural contractor. The construction of the building will be completed mostly by local partners, contractors and suppliers. The new National Bank’s head office will be located at 800 Saint-Jacques Street West, in the heart of the Quartier de l’innovation, and will be linked to Montreal’s Underground City (RÉSO). This marks the return of the Bank’s head office on Saint-Jacques Street. With its 40 floors, the nearly 200-metre-high building will be one of the tallest office buildings in Montreal. Construction work is expected to take four years, and be completed by the end of 2022. The building will meet the world’s strictest standards in terms of sustainable construction, integrative design and will promote its occupants’ health and well-being. The objective is that the new spaces will be admissible for LEED v4 Gold and WELL certifications. A 40,000 square feet city park will be created at the foot of the new building and will be made available to the public to enhance this area of the city and attract traffic outside of business hours. The building’s unique design will emphasize collaborative, modern, bright, and technology-driven spaces, and will draw on the concepts used to design the collaborative spaces already created by the institution. The building will feature a large and bright entry hall, a National Bank business centre, a conference centre, a two-level cafeteria, a daycare centre, a gym, 400 bicycle parking spaces, 80 charging stations for electric cars and an outside garden on the 40th floor, at some 190 metres high.